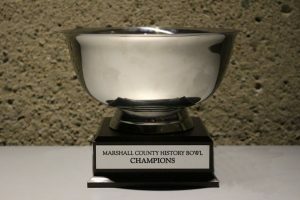 Cameron Blue once again took home the Marshall County WV History Bowl Cup. The 3rd annual Marshall County Schools West Virginia History Bowl was held Tuesday at the Grave Creek Mound Archaeological Complex in Moundsville. Commissioner of the WV Division of Culture and History Randall Reid-Smith emceed the tournament. Reid-Smith founded the statewide competition in 2010. Both Cameron teams made it to the finals. Cameron Blue won the competition with a score of 22 points while Cameron Gold scored 20. Moundsville Orange earned 3rd place. Sherrard White came in 4th, Moundsville Black 5th and Sherrard Red 6th. All Marshall County Schools teams will compete again at the Region VI WV History Bowl on Friday, February 16, 2018 at Independence Hall in Wheeling. Two teams will advance to the state competition at the Culture Center in Charleston on Tuesday, April 24, 2018. Cameron High School is the defending state champions.